Enjoying a beautiful secluded position surrounded by pine trees and just a short walk from the sandy beach. 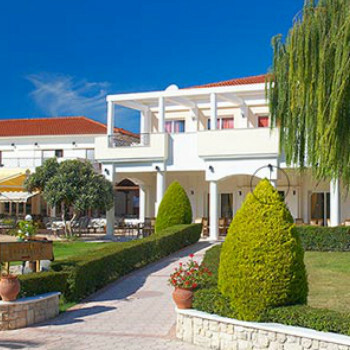 Set in spacious, decorative gardens, with plenty of activities on offer, families can enjoy a typically Greek holiday here. As always, I spent the day before I went away worrying and wishing I wasn't going - the minute I stepped into my apartment my worries vanished. I'd paid extra for a 1-bedroomed apartment (rather than studio) for my daughter and I and it was lovely. Loads of space in both rooms complete with a kitchenette area - slightly unusual for an all inclusive hotel but the kettle was very welcome! The whole hotel area was beautiful and extremely clean. Main problems were wasps during the day and mosqitoes at night but you can hardly blame the hotel for that. The pools weren't very big and instead of tiles had a sort of painful pebble-dash finish which really hurt when you scraped on it but it was so hot when I was there I didn't really care - as long as I could roll in when I got too hot I was fine. The rep, Katie, was there all the time which was good. She wasn't always on duty but was always ready to help. The 3 kids reps were also fantastic - I don't know how much they get paid but I'm sure it's not enough. They ran 2 or 3 kids club sessions most days of the week. There was also a hotel-run kids club but my daughter didn't go to this so I can't comment. We did attend the mini-disco most evenings then the entertainment afterwards. This was either bingo or a really bizarre music quiz. We really enjoyed these (I might be biased because we kept winning prizes!) but everything ended very abruptly at around 9.30 - it would have been better if things went on a little longer then wound down. Food got a bit boring after 2 weeks. We don't eat meat and this could be a little difficult at times - the seemed to hide meat in half their dishes! It was plentiful though and my daughter was delighted that the 3 main food groups (pasta, rice and chips) were always available. Altogether we both had a really good time and I would certainly recommend this hotel. Booked as a last minute deal, but if I'd had the chance to do some research, we would have picked somewhere else. Transfer from the airport took over 2 hours in a coach with faulty air conditioning. Hotel complex itself was lovely - pretty gardens, apartment blocks not too squished in, attractive reception area. Apartment was bigger than we expected with a little kitchenette, but had obviously seen better days. We think the shower room was supposed to be a wet room, but there was a step down into the kitchen area, so guess what happened every time you had a shower! However the maid service was excellent and the cleanliness of the whole site was good. The food however was a different matter. The snack bar advertised in the brochure is basically a hot table with leftovers from main meals and I would be extremely dubious about eating any of it. In the restaurant itself none of the food was ever hot and most of it was swimming in three inches of grease. It was also rather monotonous. We were given packed lunches when going on a trip, and the only comment I can make is don't bother. 1 stale sandwich, an apple and a tiny bottle of water is not a packed lunch. It's actually the location of the hotel that would have put me off booking if I'd realised where it was - right at the end of a long peninsula and miles from anything. Even the beach (ten minutes away, according to the brochure) was at least a twenty minute walk unless you were prepared to brave the biggest wasps I've ever seen and the nearest village a taxi ride. Don't expect to be able to use the 'free bus' advertised. It ran twice a day at best and had 11 seats. We were bored silly due to the complete lack of entertainment (there was none at all the week we stayed) so booked a couple of trips through First Choice having made quite careful enquiries as to distances involved because of previous 'errors'. The first one involved over two hours touring the local hotels picking up other guests (once more on a coach with faulty air conditioning) then another two hours to our first stop, all without any hint of a break. The trip itself - the Royal Tombs at Vergina - was excellent, but the thought of the return journey killed most of the pleasure. As a result of that trip and despite drinking water almost constantly I was so severely dehydrated that I needed medical attention. This is the first, and will be the last, time that we have booked a 'package' holiday. Luckily it wasn't our first visit to Greece, or it might also have been the last. Stayed all inc: food i thought was very good accomodation ok (apartment a bit tired and basic) maid service excellent.The place needs entertainment a nice greek show with dancing etc might have been nice, the entertainment people need to get a grip and concentrate on the evenings as they can get a bit boring with nowt to do, gardens were brilliant but there was a strong smell of sewerage at the top end of the complex where we were staying and some nights we could not open the patio door to sit out on the balcony the smell was that bad! But all in all good holiday nice people First Choice rep very good. We stayed at the resort in July 2007 and had an extremely enjoyable stay. The resort is like paradise with immaculately maintained gardens. We adored the food and the vegetarian in our party had no trouble at all - only problem is there is a greek slant to the presented dishes. In Greece. Who'd have thought. This holiday was our first time in Greece, first all inclusive package and first time with First Choice. We will be doing all again. Highly recommended. The hotel has fabulous surroundings. The food was basic but nice (dont expect a fryed breakfast)as your in Greece. Well done to all the staff always there to help and right behind you to clean after you. The entertainment for kids was good and if your into bingo and pub quizzes then this is for you we made our own entertainment. Cannot fault the First Choice reps they where fantastic (nic, Loopy Lu and Crazy Chris)a big thank you to them for a fantastic holiday. Arrived at 4.30pm after a very long 2hour coach trip room was bigger then expected ther was no bath and you had to mop the bathroom floor everytime you had a shower ther was also quite alot of mould that was hidden behind the beds and it did smell quite damp could withe the damp sorting out and a good lick of paint. The hotel grouns itself were very clean.the food was very basic and a bit boring. the entertainment was pathetic nothing if you were over 8years old. And there was and I am not joking millions of mozzys. This is the second time we've been to the chrousso village and we had a fab time. The room was clean and the staff were lovely. The entertainment is a bit basic but that didn't really bother us. The Restaurant was great and the (Gorgeous) waiter and lovely waitresses were all very friendly. The reps 1st time round were fantastic!! but the reps this time were a bit lame and didn't really want to no. Despite the useless rep we will Definitely be going again!!! The food was mostly ok, we did find however that on BBQ night and Gala nights it was particularly bad, uncooked meats and very little choice for vegetarians (we had one in our party), also no ice cream available on these nights for afters! The majority of the staff were wonderful, but you always get the odd one or two that spoil it and this was indeed the case on our visit. The beach was wonderful, but due to the stink of sewerage on and around the complex the walk through the woods was not possible, in stead we had to take the risk of walking the road way with no paths! We had a major problem with wasps, thousands of the damn things, we had 4 in our party stung plus many children and adults who we met up with, we all commented that we would be coming home with twitches where we have swatted so many! Entertainment - What entertainment! absolute crap! We are just glad to be home, we wished we had only booked 1 week but had to endure 2! The hotel grounds are stunning which added to a really relaxing holiday. The food was typical Greek a good variation each day a BBQ on sat and gala night on a Mon lots of ice cream for the kids. The rooms are vary spaced out great for a family of 4 would say even a family of 5. The location of the hotel is a little out of the way so no evening walk outs from the complex you had to book a courtesy bus well in advance to take you up to the 2 main towns this wasn't a problem though. The staff were excellent they work long hours but always had a smile on their faces. The entertainment was a little poor on an evening but you soon make lots of friends on this holiday so you make your own entertainment. Mini disco most nights and quizzes.